We have been following the fascinating litigation over the Kansas City Royals mascot, Sluggerrr, and his tortious injury to fan John Coomer. The Missouri Supreme Court has ruled on behalf of a baseball fan who says he was hit in the eye with a hot dog thrown by Sluggerrr, the Kansas City Royals mascot. Coomer sued the Kansas City Royals and its mascot Sluggerrr after he was hit in the eye by a hot dog thrown into the crowd. Coomer suffered a detached retina and other injures. A jury ruled against him in favor of their popular mascot in a verdict that I previously questioned since it seems to be clearly negligent to fire these projectiles into the crowd. The Missouri appellate court later wisely reversed the verdict. Now The Missouri Supreme Court has ruled in Coomer v. Kansas City Royals, and affirmed the appellate court — a two-appeal losing streak for Sluggerrr. At trial, Mr. Coomer testified that on September 8, 2009, he went to the Royals game with his father. To be closer to the game, instead of sitting in their ticketed seats, Mr. Coomer and his father sat in open seats six rows behind the third base dugout. 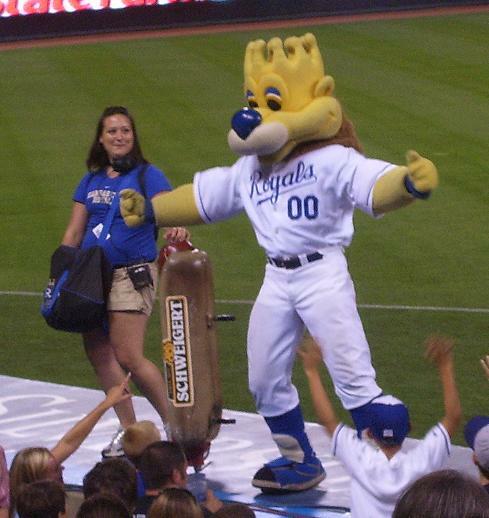 Between the third and fourth innings, the Royals had a promotional event, the “Hotdog Launch.” Mr. Shores testified that the Royals had been doing the Hotdog Launch at home games since approximately the year 2000. In between innings, the Royals launched 20-30 hotdogs to the fans, either through an air gun or by a hand throw. The hotdogs shot out of the air gun were wrapped in bubble wrap and the ones Mr. Shores threw were typically wrapped in foil. Mr. Shores testified that he used a number of types of throws to entertain the fans: “overhand, over the shoulder, behind the back, . . . sidearm.” The jury was shown videos of several games, including the night of September 8, 2009, although the throw at issue had not been videotaped. Mr. Shores had no recollection of conducting the Hotdog launch any differently on September 8, 2009. He shot hot dogs into the stands with an air gun, and then began tossing hotdogs into the stands by hand. Mr. Shores was in the third base dugout, in front of Mr. Coomer and his father, and people behind them were cheering and yelling for Mr. Shores to throw hot dogs to them. Mr. Coomer testified that he saw Mr. Shores turn his back and make a motion with his arm behind his back; Mr. Coomer looked away to the scoreboard and “a split second later” something hit him in the face. The impact knocked off his hat. Because the throw came so quickly, Mr. Coomer was convinced it was a straight-line throw rather than the soft overhand tosses Mr. Shores had previously been making. Two mornings later, Mr. Coomer noticed a problem with his vision. A tearing and detachment of his retina was subsequently diagnosed and he underwent surgery. He lost vision in his eye for about three weeks and subsequently developed a cataract. In December 2009, Mr. Coomer had an additional surgery for the cataract and now has an artificial lens in his eye. He testified that his vision in that eye suffers more impairment than prior to the injury. When the risk arises from the circumstances (e.g., from a condition on the defendant’s property or the inherent nature of the defendant’s activity), “implied primary assumption of the risk” completely bars recovery by a plaintiff who knowingly and voluntarily encounters that risk. Krause v. U.S. Truck Co., Inc., 787 S.W.2d 708, 711-12 (Mo. banc 1990); Reflections, 50 UCLA L. Rev. at 487-88. When the risk is created by defendant’s negligence, on the other hand, this has been identified as “implied secondary assumption of the risk.” Lewis v. Snow Creek, Inc., 6 S.W.3d 388, 395 (Mo. App. 1999); Reflections, 50 UCLA L. Rev. at 489. Understandably, courts were less willing to bar all recovery in the latter circumstance unless the plaintiff not only knowingly and voluntarily acquiesced in the risk created by the defendant’s negligence but also acted unreasonably in doing so. Id. Accordingly, prior to the advent of comparative fault, a plaintiff’s claim was barred completely by assumption of the risk if the plaintiff (a) expressly consented to assume a known and understood risk (i.e., “express assumption of the risk”); (b) implicitly consented (based on his conduct and surrounding circumstances) to assume a known and understood risk that was not created by the defendant’s own negligence (i.e., “implied primary assumption of the risk”); or (c) implicitly consented (based on his conduct and surrounding circumstances) to assume a known and understood risk that resulted from the defendant’s own negligence, provided that the plaintiff acted unreasonably in doing so (i.e., “implied secondary assumption of the risk”). Though all three were lumped together under the heading of assumption of the risk and treated as affirmative defenses, only the latter application was properly viewed as such. The version of comparative fault adopted by this Court in Gustafson fundamentally altered this landscape. Section 1(a) of the Uniform Comparative Fault Act (the “UCFA”) provides that “any contributory fault chargeable to the claimant diminishes proportionately the amount awarded as compensatory damages for an injury attributable to the claimant’s contributory fault, but does not bar recovery.” Gustafson, 661 S.W.2d at 18 (quoting from the UCFA, which is set forth in full in an appendix to that opinion). Section 1(b) of the UCFA defines “fault” for purposes of section 1(a) to include “unreasonable assumption of risk not constituting an enforceable express consent.” Id. to the Royals, the risk to a spectator of being injured by Sluggerrr’s hotdog toss shares the same essential characteristics as the other risks that this Court (and many others) determined long ago were inherent in watching a baseball game in person, i.e., risks that a spectator will be injured by a flying ball or bat. The Court disagrees. The rationale for barring recovery for injuries from risks that are inherent in watching a particular sport under implied primary assumption of the risk is that the defendant team owner cannot remove such risks without materially altering either the sport that the spectators come to see or the spectator’s enjoyment of it. No such argument applies to Sluggerrr’s hotdog toss. Millions of fans have watched the Royals (and its forebears in professional baseball) play the National Pastime for the better part of a century before Sluggerrr began tossing hotdogs, and millions more people watch professional baseball every year in stadiums all across this country without the benefit of such antics. Some fans may find Sluggerrr’s hotdog toss fun to watch between innings, and some fans may even have come to expect it, but this does not make the risk of injury from Sluggerrr’s hotdog toss an “inherent risk” of watching a Royals game. As noted above, “inherent” means “structural or involved in the constitution or essential character of something: belonging by nature or settled habit,” Webster’s Third New International Dictionary (1966), at 1163 (emphasis added). There is nothing about the risk of injury from Sluggerrr’s hotdog toss that is “structural” or involves the “constitution or essential character” of watching a Royals game at Kauffman Stadium. It is a great read and one of the best comprehensive treatments of comparative negligence and assumption that I have read. I can only imagine the voir dire in jury selection on this case. I wonder what that Wiener guy in NYC who was in Congress would have to say about this. Who has the record for getting hit in the face w/ the most balls? he went to a ball park and got hit in the face by a wiener. jim, The Sox certainly did giftwrap the ’86 Series for the Mets. Regarding kids not playing baseball, it is sadly true. In large part it is about fear and false self esteem. Getting hit by a fastball is a primal fear. I’m sure you remember some of the times you got plunked. It hurts like hell! Our mommy culture hovers over kids and seeing their poor darlings get drilled w/ a fastball is just too much to bear! The other aspect is you can’t hide in baseball. You strike out, it is that LOOONG walk back to the dugout. You make an error, it is documented, E6, E3, etc. I think that’s why soccer is so big for youth w/ “soccer mommies.” You are just part of a mass of activity. The only person who has any accountability is the goalie. Play soccer, mommie brings orange slices and snacks, and everyone gets a medal! When moms would ask them about a “treat list” for baseball I would tell them I didn’t believe in them! But, w/ all of our wealth and focus on soccer, we still get routinely beaten by 3rd world countries where kids barely have enough food to eat. Paul, Just for arguments sake, who gets to define “intrinsic to the game”? If hot dog throwing is regularly done at Kansas City doesn’t that become part of the game? Jim22 – the court was very careful to set out the parameters of what was intrinsic to the game. Throwing hot dogs is not. It would have to be something done at every park during every game and, it would seem from the decision, historical in nature. I don’t understand why Crooner is not deemed to have assumed the risk. The hotdog launching promotion started in the year 2000. It had been a part of every home game for about nine years prior to Crooner’s injury in 2009. Crooner estimated he’d been to about 175 games before the injury and acknowledged that he’d seen Sluggerrr hurling hotdogs before. Furthermore, Crooner abandoned his assigned seating and chose to deliberately position himself in harm’s way by taking a seat just a few rows behind the dugout where he knew Sluggerrr would be chucking wienies at people. So: 1) Crooner knew hotdog launches are part of a Royals home game experience; 2) Crooner had seen Sluggerrr winging weinies at people in some of the 175 games he’d previous attended; 3) Crooner intentionally positioned himself within range of a flying wienie. I don’t get how Crooner did not assume the risk of being hit by a flying hotdog. In fact, it seems reasonable to assume that he abandoned his assigned seating not only because he wanted a better seat to watch the game, but if he got lucky Sluggerrr might hurl a free hotdog his way. Groty – the court held that the assumption of the risk held only for things intrinsic to the game. Hot dog throws are not intrinsic to the game. Nick, Funny you mention hating the Sox. I used to tell people I hated them not because of the rivalry with the Yanks, but because they let the Met’s win in 86. I remember reading about Nettles and Gossage talking about the rivalry and those two really hated the Sox in the 70’s and were kind of annoyed at how the players reacted or lack there of when Pedro threw Zimmer to the ground. My memories of those days are fond ones watching the games on WPIX (no cable then) with my two older brothers who taught me how to play the game. My brother Tom leapt so high when Bucky Dent hit his famous homer that he put his head through the dropped ceiling. My brother also Tom would not let me back in the house after a game of catch until I caught 3 balls that he would throw straight up in the air. Because if this, I could always catch a ball so they put me at first base in little league. I wanted to play SS since dent was a hero. I learned to enjoy 1B but one day I got hit by a pitch and had a slight fracture on my right hand and couldn’t play first so they put me in left field. Well, the first ball that was hit to me I made a diving catch on and I never went back. All those hours of playing horse were paying off. I still play out in left since I can still get a decent jump on the ball. I pitch some, but like our earlier posts, I haven’t jot the change up down yet so success varies when I’m on the mound. I also catch when it is needed. I caught a lot for a team I played for a couple of years ago. We had this guy who was just over 60 still pitching in our league. Man he could still throw. He had 5 legitimate pitches and was a blast to catch for. The league I’m in has several divisions 35 and over, 45 and over and 55 and over. They used to have a 25 year and over but it dissolved due to low roster. I hope it isn’t the sign of things to come since kids in my experience aren’t playing the game as much unless they have overbearing parents. I could write baseball all day. It’s so much more fun than politics! Let’s cut through the BS. This guy doesn’t actually believe that crap and neither does anyone else. Saudi Arabia’s version of sharia law is constructed for one purpose. Protect the continues power and $ of the Saud family at ANY cost. This is right of the Divine Right of Kings nonsense. I would rather go back to horse and buggy than allow the Sauds to continue their century of mass murder. Paul, The wienermobiles are run out of the Oscar Mayer headquarters in Madison. There are several of them. Oscar Mayer hires vivacious young people, many marketing majors from UW, to drive assigned regions of the country as goodwill ambassadors. Ironically, Oscar Mayer was sued over the wiener whistles they used to pass out to kids. Turns out they were too small and some youngsters choked on them. This was years back. I worked a very unique case[busting your balls, never reveal to me something that ticks you off!!]. I was hired by a company out of Canada that made heavy doors, mostly for walk in coolers. They outfitted the walk in cooler doors, but also the cooking conveyor system w/ their doors, @ Oscar Mayer. The hot dogs go through different stages of processing, steaming, smoking, cooling, etc. At each stage of the process a door is present for inspectors, maintenance, etc. These doors have a latch handle on the exterior and a simple, plunger type handle on the interior. That is for safety reasons, you don’t want a person stuck inside. Well, a worker did get stuck inside and was damn near cooked to death. Second and third degree burns over most his body. He claimed he went inside, while the conveyor was operating to check out a possible problem. Highly suspicious. He also claimed the plunger handle malfunctioned and he couldn’t get out. His attorney’s theory was it was a metallurgical issue. The doors were built for cold temps, not hot. I determined he went in to steal a couple of dogs for lunch. He did this all the time. He got choked by the smoke, panicked, and couldn’t find the door. Nick – stealing employees are not either unique or very unique. KarenS, I am not an attorney but can give you some basics. CA., I believe, is a “pure” comparative negligence state. In a nutshell what that means is everyone, including the plaintiff, is assigned a % of negligence. I have followed the Stowe case. He has VERY LITTLE negligence. The Dodgers and the shitbirds who assaulted him will be on the hook. Since the Dodgers have the insurance, they will be paying. If the shitbirds had homeowners insurance[doubtful] that could be tapped to pay damages. Insurance companies pay damages, except in rare instances when a defendant is very wealthy. The Dodger’s liability insurance carrier will most likely be writing a 7 or 8 figure check. Any attorneys are free to critique my thumbnail sketch. What kind of dogs like Armour Hotdogs? Fat dogs, skinny dogs, dogs who climb on rocks. Slim dogs, weeny dogs, even dogs with chicken pox.. The dogs.. kids… like… TO BITE!